Since I have posted wayyy to many sweet treats, I thought I’d take a break from it and serve up something lighter. Both in tone, taste and preparation. 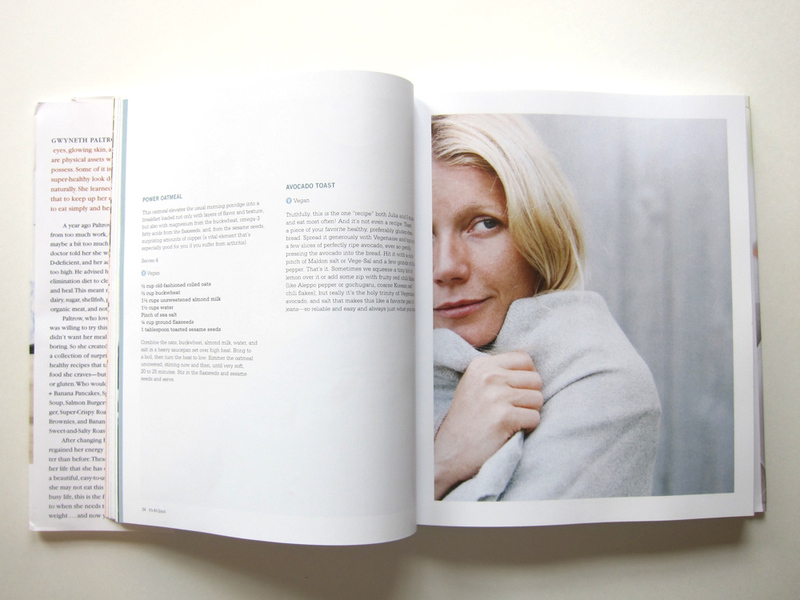 This one’s from- hold your breath- Gwyneth Paltrow and Julia Turshen’s cookbook It’s All Good: Delicious, Easy Recipes That Will Make You Look Good and Feel Great. Oh yes, back to the book. Now, there are some paragraphs that are pretentious, along with some cringe-worthy pictures that don’t really make sense. 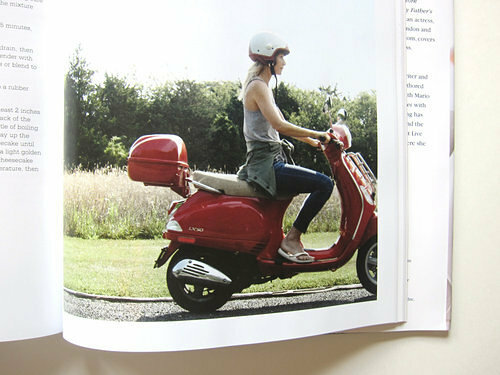 Like, for instance, GP riding a Vespa, and another one where she is sideward-glancing while wrapped in a blanket. And of course, there is name-dropping: recipes from her ‘besties’ Cameron Diaz and Gavin Rossdale…but she’s a celebrity, and celebrities befriend celebrities, so it is but natural that they swap recipes, no? So yes, there are few portions you’d want to skim over, but once you do, you’ll realize that there are some pretty neat recipes beneath it all. Having said that, the salad, vegetable and grains sections have plenty of wonderful recipes that can be recreated with ingredients that are easily available in India- and many are naturally vegan and gluten-free. Sweet potatoes, corn, eggplant, beets, leeks, carrots, mushrooms, daikon radish (regular desi mooli.) Most of these vegetables can be found in markets in India. There are of course, some veggies and grains (romesco, kale, quinoa) that I don’t have easy access to, but even without those recipes, there is enough variety to choose from. This beet salad is one of them. Easy, delicious and can be made ahead and assembled before lunch/dinnertime. The mint+scallion pesto is a keeper- I used it on toast, tossed in pasta, in omelettes, as a topping for crackers- versatile, like pesto should be. The raw garlic gives it a pungent, almost spicy punch, and the toasted almonds add great depth. And nibble!! Drizzle the pesto over the beets, or just gob it on with a spoon like I did. 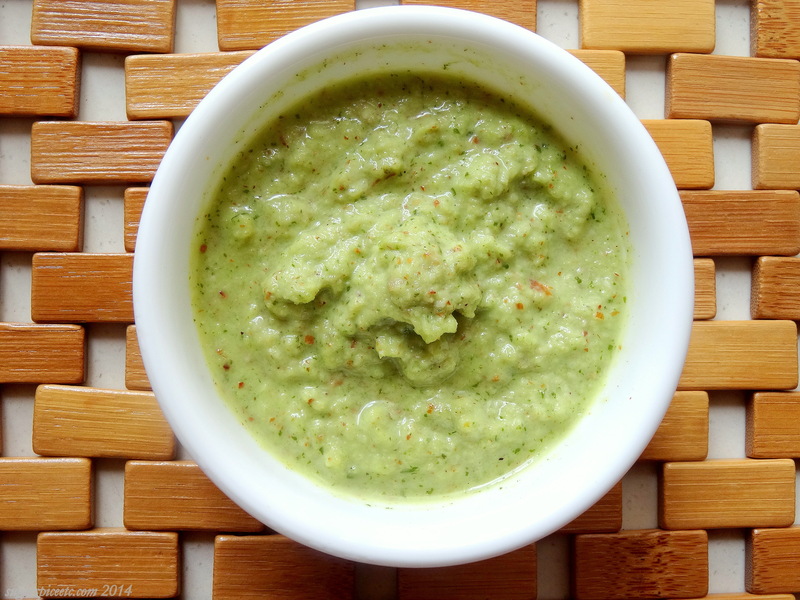 Puree all the ingredients in a powerful blender until smooth. 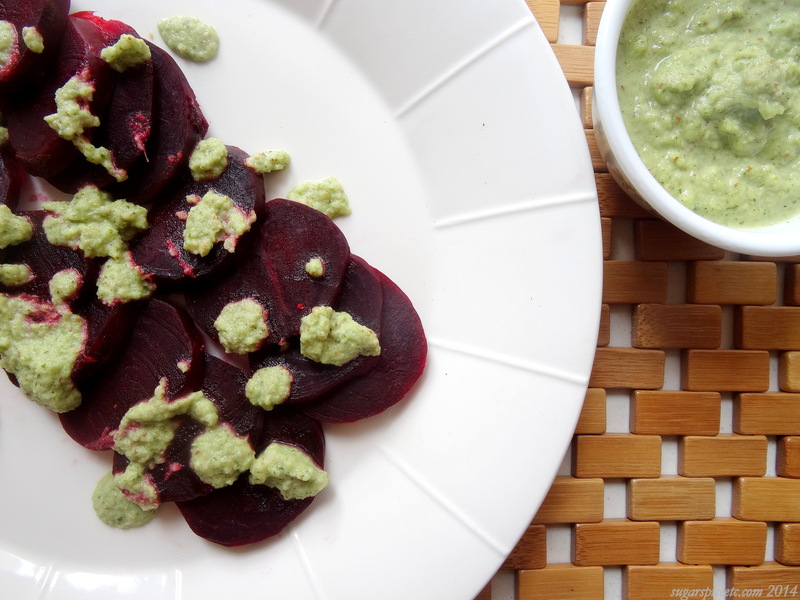 To assemble, arrange the beets on a plate and pour/drizzle/dab the pesto all over it. Hey thanks Sarah! Hope you find the comments abt the book useful. The pesto is really good. It can taste a bit astringent at first because the scallions and garlic are both used raw- but the toasted nuts help even it out. And it it’s still too sharp, a dash of olive oil does the trick. I made this again recently for my dad and he found it sharp, so I added more olive oil and toasted nut paste. The pesto sure looks and sounds yummy. Can’t wait to try it out myself. Will toasted cashew nuts be okay in place of toasted almonds I wonder ? ?